The Arch of Healing and Reconciliation will be a monument to honor the brave immigrants to the Pacific Northwest from China, India, and Japan, and in recognition of all immigrants who have come to America since the 1800’s, seeking better opportunities for themselves and their families through hard work and determination. Bellingham has a long, proud history of immigrants traveling through on their way up and down the West Coast. Many have settled here and have made significant contributions to the community, but the community hasn’t always been a welcoming place for immigrants. Chinese, Indian and Japanese immigrants, in particular, were targeted and forcibly removed from the city in 1885, 1907 and 1942. The concept for an Arch of Healing and Reconciliation began on the 100th anniversary of the 1907 “Riots” targeting Indian immigrants. As the Whatcom County Council issued a proclamation commemorating the events and apologizing for the government’s role in the violence, members of the county’s Sikh community began thinking about ways to memorialize the immigrant pioneers. However, it took us almost 10 years to bring it to reality. In the meantime, Lynden Sikh Temple provided funding in 2013 to commission a documentary, “We’re Not Strangers” about the history of the Bellingham Riots of 1907, with generous support from Mr. Bicky Singh (Sikhlens.com) in collaboration with Dodge School of Film at Chapman University, of Orange, California. As the 110th anniversary approached in 2016, the idea for a memorial arch was still a dream in the Sikh community. Soon the dialogue grew to include local Chinese and Japanese community members to make this Arch a shared memorial for immigrants from India, China and Japan. The committee drafted a vision to install a Red Granite Arch structure named Arch of Healing and Reconciliation. Our proposal was well received by the Bellingham City Council, the City Arts Commission and the City Parks Board with unanimous approval. Our committee has also gained the support and collaboration of the Whatcom Community Foundation. Our plans to make a lasting impact on our community include more than the Arch of Healing and Reconciliation — we are also building a significant college scholarship fund for the children on Whatcom County immigrants and developing an annual international food festival in Bellingham. Create a lasting memorial for the all brave immigrants who have come to Whatcom County since 1800s, who dared to come to America seeking better life opportunities for themselves and their families, and who helped build our community through their hard work and grit. Create teaching and a learning opportunities for future generations in the hope of avoiding additional anti-immigrant violence. Create educational opportunities for new immigrant families and their children through the development of a significant college scholarship fund. Build the Arch of Healing and Reconciliation. Establish a College Scholarship Fund for the students from First Generation immigrant families. 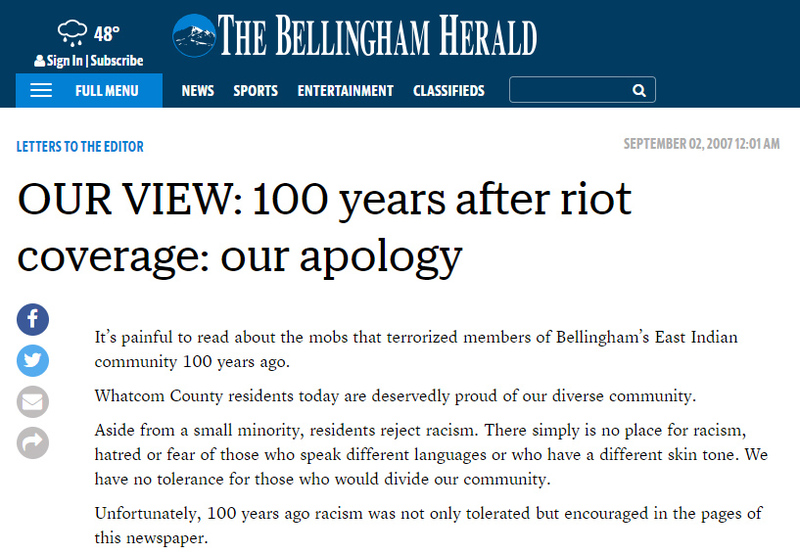 Publish a Booklet (paper and digital) about historic background of events in Bellingham, supported by website. Develop an Exhibit for Whatcom Museum about these events. Celebrate diversity of our Community by launching an Annual Ethnic Food Festival on Labor Day.